Theresa May has thrown down the gauntlet to confront the latest meddling EU intervention. She also threw down the vambrace, breastplate, pauldrons and helmet, and she had every right to. When the European Union’s top brass troll her on Twitter, mocking the Conservative Party’s election slogan (during the General Election campaign), leaking outrageous accounts of prime-ministerial discussions over dinner, accusing her of being ignorant or delusional (for that is what “living in another galaxy” means), it’s time to fight back. O, you can tweet piously about her reckless posturing, or of sacrificing the long-term national interest for short-term partisan advantage. But that would be to misunderstand the nature of the bully: Jean-Claude Juncker, Guy Verhofstadt, Michel Barnier and Angela Merkel have an agenda, and they want to win. That means Theresa May has to lose. “Let us make Brexit a success,” she urges, fraternally. “Brexit cannot be a success,” replies Juncker, despotically. You see, if “Brexit cannot be a success”, the people of the United Kingdom must be made to suffer for their foolish decision to leave the European Union, which, as the Bishops keep telling us (pace +Shrewsbury), is God’s kingdom on earth. Non-believers must be cast into outer darkness, where there shall be weeping and gnashing of teeth. Theresa May must be humiliated on the world stage, along with all her clownish lieutenants – Boris Johnson, David Davis, Liam Fox (and not forgetting Michael Gove). These arrant twits dared to challenge the divine right of ever closer union, and they duped the people with lies and sophistry into believing the illusion. And so they must pay for their heresy – with flames of shame, if necessary. These are just the opening salvos; the polarised negotiating positions of each faction. But in politics you don’t meet the din of power and patronising pressure with a polite nod and a limp handshake. The EU27 reportedly want the UK (that’s us, the taxpayers) to fork out a €100billion ‘exit fee’. That’s the immediate material cost of Brexit. There must then be an economic cost, a cultural cost and a spiritual cost. Brexit cannot be a success. Enter Britannia May: she is England, Scotland, Wales and Northern Ireland. If she allows the bullies to win, she not only loses her own head, but risks the entire Union fracturing and fragmenting along the lines of ancient enmity. Brexit must be a success. There is no room even to contemplate that it cannot be, or the electorate will ensure that she will not be for very much longer. 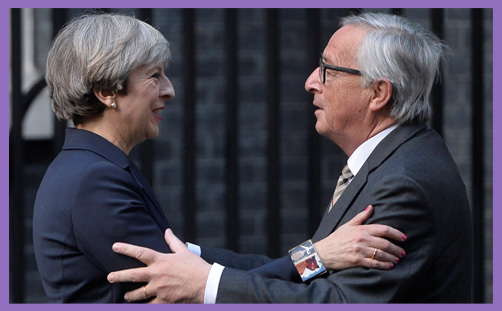 Thus Juncker must be countered, and slapped down robustly. That’s all you can do to an unaccountable, immovable Brussels bureaucrat. If you think Theresa’s frit? She’s strong and stable, just watch her seize the day.